Over the past few months, many of my peers have been going through the motions of obtaining a drivers license. It’s a tedious process, with much time spent at the DMV, so it’s natural for anyone to complain. However, the comments I’ve been hearing are, to say the least, off-putting. Any immigrant is an equal to an American, with race being the only differentiation between the two. In southern California, immigrants are more often than not Hispanic, so this idea that immigrants should not receive a license has ended up targeting a specific race. Though Hispanic or not, all people are created equal, so shouldn’t this not matter? Aren’t we supposed to be a melting pot? Isn’t diversity and tolerance of different ethnicities what we’re supposed to be known for? Immigrants are just as much people as any American born person, so it’s unconstitutional to think that a white person would be prioritized over a Hispanic, or any other race. A license is necessary for almost everyone. There are jobs that require driving. There are children that need to be shuttled to school. Life is unlivable without the ability to drive, so regardless of whether or not they’re licensed, immigrants will drive. Crash data collected over 23 years from a DMV study stated that a fatal collision is more likely to be caused by an unlicensed driver. Even without statistics, this is common sense. If you haven’t been tested or studied the rules of the road, you’re more likely to be a hazard. So for the safety of everyone on the road, including immigrants both legal and illegal, everyone should have the right to get their license. And they do. California is one of the 10 states that provides licenses to undocumented immigrants. Though by law immigrants are being granted this right, there’s still a stigma, a negative connotation, surrounding the situation. In some states, only illegal immigrants are ever withheld from obtaining a license, yet from all the talk I’ve heard, all Hispanics are just referred to as “immigrants” and “Mexicans.” This is generalizing them all as aliens, despite that fact that Hispanic culture is prominent in California already. The fact that teens can be so unfamiliar and uncomfortable with other races just tells us how xenophobic our generation really is. Perhaps some believe illegal immigrants should be restricted from being licensed simply because they don’t pay taxes, but like I stated before, licensed or not, immigrants will drive. It’s practically obligatory to raise a family. Letting them drive unlicensed is unsafe, and everyone on the road is better off if they have received formal training and testing. This is applicable to all immigrants: legals, illegal, Hispanic, or any other race. Do you want your country to be a melting pot, or do you want it to be a prejudice piece of land run by people willing to strip minorities of their rights solely to improve their own lives? Obviously not the latter, but this is the direction we’re heading in: a country ruled by people too uninformed to know that not all Hispanic immigrants are Mexican. So stop ignorant slurs and stop xenophobia. Realize how many minorities exist in our lives. Does every single one of these people deserve to be robbed of the necessity of legal driving? No. So decide whether or not you want to be an oppressor. 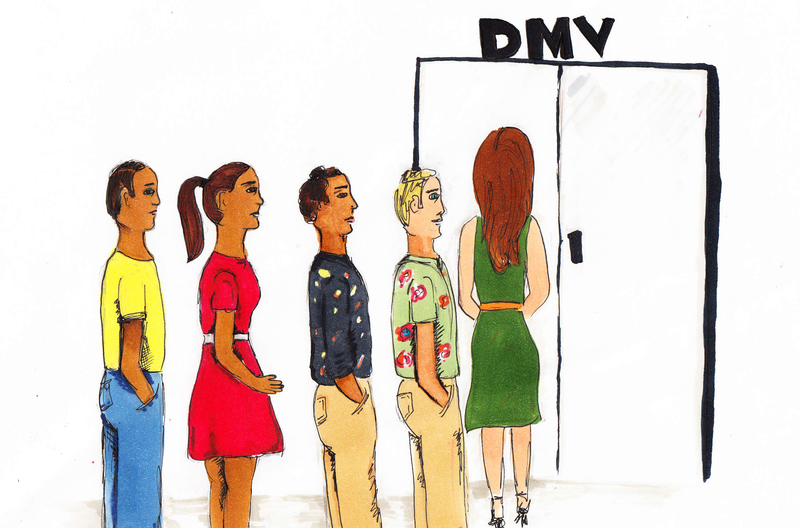 Drivers licenses are a mere factor of the oppression of immigrants, so don’t let greed and impatience create yet another racist, unconstitutional blow to minority races. There are so many things you could blame the line at the DMV on before making the prodigious, unjustified leap of blaming an entire group of people. At age 16, you’re expected to be mature enough to operate heavy machinery like automobiles, so shouldn’t you be mature enough to realize what is and isn’t completely ignorant and racist?